Climate is cloudy these days in Singapore and we generally prefer to have hot piping soups for dinner. I generally make something which is very filling and healthy. Avocado Mint soup is one such soup which I found in Pinterest few months back and now this has become a part of our regular dishes. Naturally nutty flavored avocado is blended with fried onion, ginger & garlic.The mix is then combined with olive oil marinated crushed mint leaves and cooked as a soup consistency. The soup is finally served with Whole wheat croutons. Avocado is known for its myriad of health benefits. During the avocado season I make it a point to use it in my cooking to the maximum. 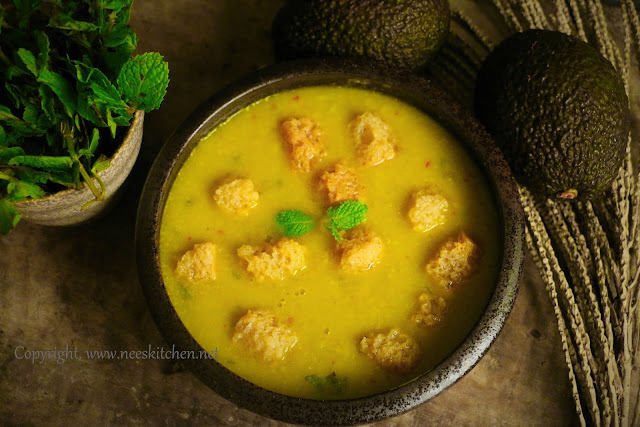 Avocado is naturally creamy in nature and hence we need not add any additional cream when we make this soup. 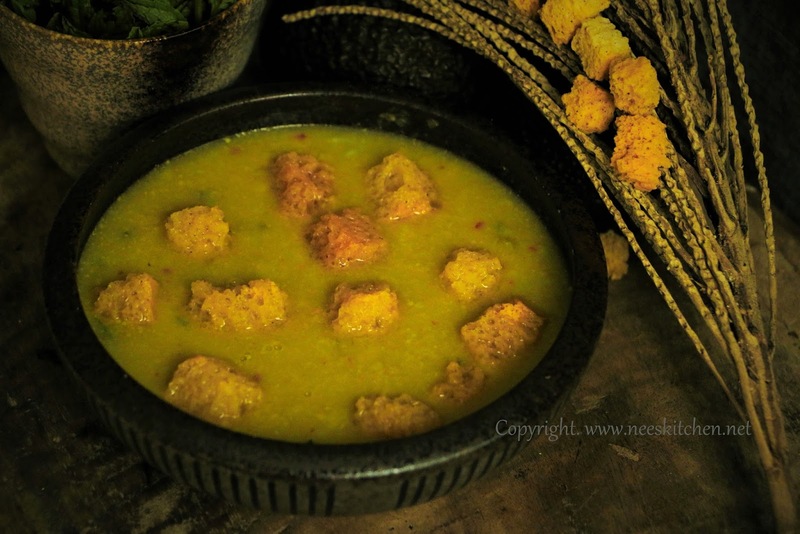 Since it’s already thick there is no need to add thickening agents like corn flour to the soup. 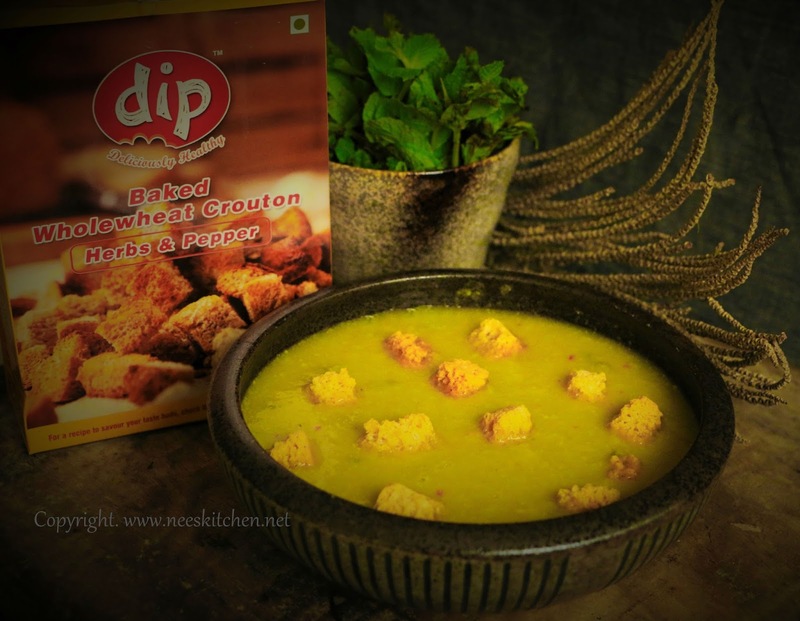 The soup is finally served with Baked Whole wheat croutons from DIP Food's.This is a simple yet filling soup. 1. Take a pan add ½ spoon oil and saute garlic,red chilli and onion. Allow it to cool. 2. Blend avocado and the fried onion,garlic and chilli mix with ¾ cup of water. 3. Pour the puree into the pan and add salt and the remaining water and let it boil in low flame. 4. Switch of the gas once you see the soup becoming frothy. 5. Take a hand mortar , add 1 spoon of olive oil and mint leaves and grind it nicely. 6. Add the mint mix into the soup. Soup is ready to be served. Serve it hot. You may add pepper and basil leaves. Make sure the avocado is completely ripened (outer skin should be black in color). If it’s not ripened put them in your rice box for a day or two.